Patrick Wisdom, who is hitting .289 with 14 home runs at Triple-A Memphis this year, had his contract purchased by the Cardinals on Saturday. ST. LOUIS, MO — After two extremely productive seasons with the Triple-A Memphis Redbirds, former first-round pick Patrick Wisdom will get a chance to show what he can do at the major league level. 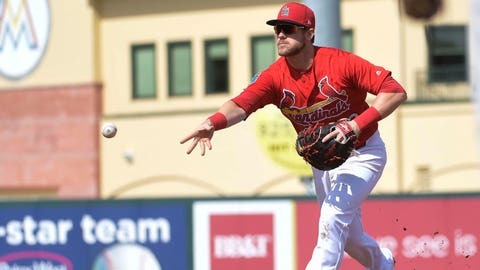 The St. Louis Cardinals announced prior to Saturday night’s game that they have purchased Wisdom’s contract from Memphis and placed rookie infielder/outfielder Yairo Muñoz on the 10-day disabled list with a right wrist sprain. The club also announced that right-handed reliever Luke Gregerson has been transferred to the 60-day disabled list. The 26-year-old Wisdom is batting a career-best .289 with 14 home runs and 58 RBIs in a team-leading 103 games this season for the first-place Redbirds. The 2018 Pacific Coast League All-Star has appeared defensively in 89 games at third base and seven at first. Selected by the Cardinals in the supplemental first round (52nd overall) of the June 2012 First-Year Player Draft out of St. Mary’s College of California, Wisdom has played in 747 career minor league games over seven minor league seasons. In 2017, he was named Championship Series Most Valuable Player for the PCL champion Redbirds. With his first game appearance, Wisdom, who has been assigned uniform No. 21, will become the eighth player to make his major league debut for the Cardinals this season, joining Jordan Hicks, Yairo Muñoz, Tyler O’Neill, Austin Gomber, Daniel Poncedeleon, Dakota Hudson and Adolis García. Muñoz has appeared in 76 games for St. Louis during his major league debut season, batting .284 with six home runs and 31 RBI, appearing defensively at six different positions. The 34-year-old Gregerson last appeared in a game on July 25, after which he was placed on the DL with a right shoulder impingement.